Cut away all the synths, guitars and other instruments, only keep the essential melodies and play them using two pianos and four hands... That's what Ozark Henry, alias Piet Goddaer, set out to do at Ozark Henry 4 Hands - September 26th, 2011 - Brussels, AB. But it ended up being a bit less exciting than expected. It sounded like the perfect setup... Ozark Henry re-invents some of his great songs and plays them with just two pianos, nothing else, in one of my favorite concert venues, Brussels' Ancienne Belgique. His partner in crime: Didier Deruytter. 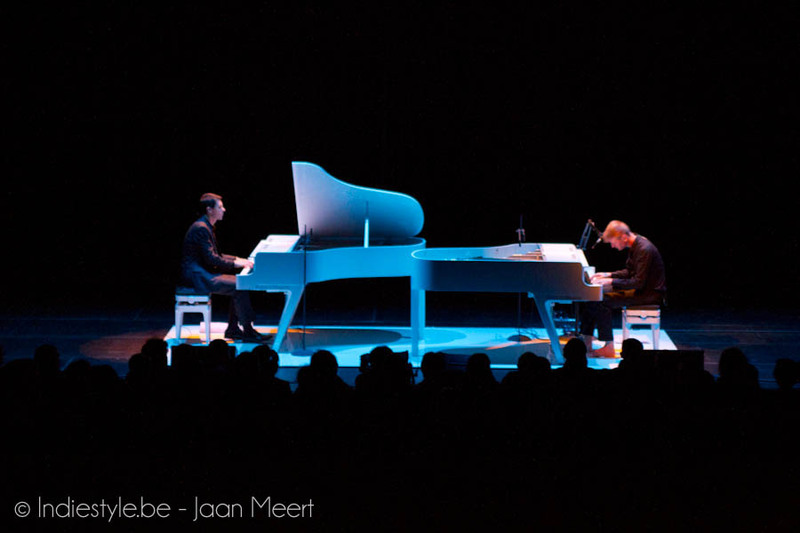 And yes, the two know perfectly how to play together... but it definitely does not come close to be as exciting as the dueling piano shows you can see at many places around the world (try: the bar at New York New York in Vegas). I mean: yes, they perfectly played in tune, and obviously had prepared themselves very well... but the excitement of playing together was missing... the interaction with the audience was missing... Point in case: I believe Piet Goddaer said "merci" exactly once (no welcome, no goodbye, no text in between any of the songs). Where they shy because they were playing in Brussels for a bilangual audience and didn't know to speak Dutch, French or English ? Or is this the same at all their concerts in this series ? I wonder.